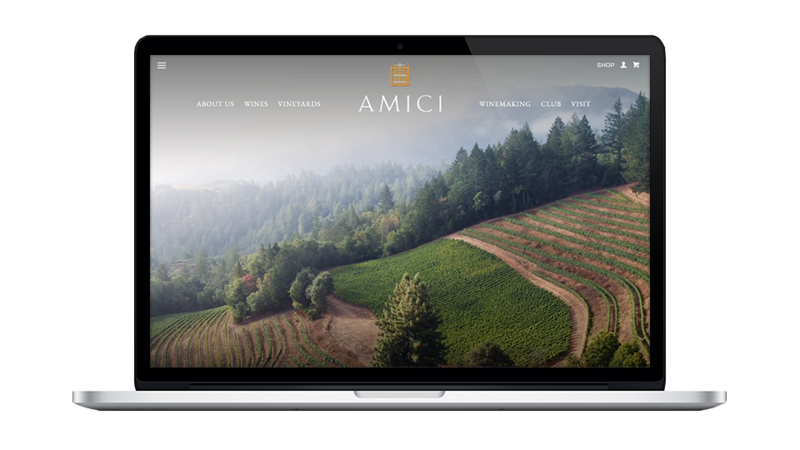 Amici Cellars in Calistoga produces award-winning premium wines from the Napa Valley and Sonoma Coast AVAs. From the flagship Napa Valley blend to the portfolio of single-vineyard wines from Napa and Sonoma’s most coveted heritage, hillside, and valley vineyards, their wines are made with deep respect for vineyard sources and thoughtful attention to detail. Created by friends, for friends. Provide information about the wines and their origin in a way that creates an emotional connection with visitors and makes them feel involved in the process. Facilitate DTC sales and wine club sign ups. Build an online presence that aligns with the newly designed brand identity and increases brand recognition. Present Amici Cellars as approachable and friendly, authentic and raw, masculine, “Old-New World”. Appeal to a wide audience of people who are passionate about great wine, primarily in the mid- to upper-income range and over 30 years of age. I can’t say enough good things about what it was to work with the Vin team on our website projects. Despite the fact that this was a complete overhaul of our current website and there were a lot of changes, Jon and Annie made the process painless. They brought a great level of expertise, had creative ideas, and above all were pleasant to work with. They were always available to answer questions and trained us along the way, so that site transition and maintenance was easy. This was truly a collaborative effort and I highly recommend them to anyone needing website design.